Now you have your Afghanistan visa in hand, so how should you plan to travel to Afghanistan? From just about anywhere in the world, routing yourself through Dubai is the route which will give the best options. twenty-two hours apart from your arrival at Heathrow. More than that you'll be charged all over again for your checked baggage. As you travel to Afghanistan, it is amazing what you can see in a London Day Trip! London Day Trips is an overview of the world class city of London with its beautiful parks and gardens, splendid architecture, West End theaters and exclusive shopping boutiques. Plan your journey back through time as you explore the picturesque towns, villages and castles of medieval rural England. Some people have never traveled in the Central Asian and Middle Eastern region of the world, and are concerned about the safety of traveling through Dubai. Dubai is one of the safest, most modern cities in the world!Check out this digital guide to Dubai. You may want to consider an overnight in Dubai just to rest, especially if you are traveling more than 10 hours to Dubai. It is not recommended to pick less than a 3-star hotel. An apartment-hotel as often been a great option for couples and families. Ariana Airlines - the national airline of Afghanistan. a.k.a. "Scariana" or "the Enshalla Airline (If God wills it)." Most NGO's and Embassies do not give their staff permission to use Ariana for work related flights. Ariana is cheaper than all the others, but please take my advice: "Live long, and fly another carrier!" 'nuff said. Kam Air - they now have online booking and electronic payments. We've flown them plenty of times, both internationally and domestically. Sorry, I've never flown them, but I haven't heard anything negative about them. 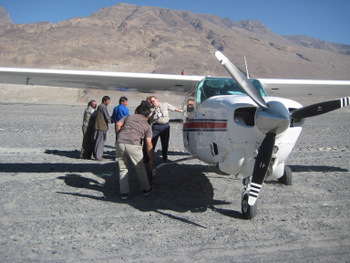 May, 2010 Update: The recent crash of Pamir flight over the Salang pass is certainly a big concern. Sadly, Pamir is choosing to use old Russian Antinovs for their domestic routes. The airplanes they use for international travel (i.e. Kabul-Dubai), are up-to-date Boeing 737 with Boeing Company approved program which is to JAA standards. Safi Air - a newer upstart, taking a lot of Kam Air's business. They do not fly domestically in Afghanistan, but are increasing the number of international routes out of Afghanistan. Safi Airlines has flights departing from Dubai's Terminal One. This means you can arrive Dubai from another international flight and not have to switch terminals. It also means that Safi Airlines has a higher approval rating by Dubai Airport authorities. The other airlines are required to park AWAY from Terminal 2. To get from the major international Terminal 1 to the much smaller Terminal 2 is a 20-minute taxi ride. Need even MORE information on travel to Afghanistan? Get our Afghanistan Travel Planning Guide. Motherly advice from an adventurous mom.